My daughter, Monica, has lupus which damaged her kidneys so much that a transplant became her only hope. She has always been an incredibly strong, determined young woman, but she’s my baby. It broke my heart a little every day to see her going through the pain and struggle. After five years on the transplant waiting list, we got the call last February. While we celebrated Monica’s second chance, we also prayed for the family we knew were grieving a devastating loss. And, we still do. Today, Monica has a new kidney and a renewed sense of purpose. She has a full-time accounting job and is studying for her MBA. She also volunteers teaching others about donation and helping at the dialysis center where she spent so many hours getting treatment. Yes, I’m a proud mom. After her transplant, we were told that her donor had registered through a DPS driver license office. I have worked at the Department of Public Safety in Houston for many years, so I knew people could join the registry when getting their driver license. But until the need touched me and my family, I never really realized how important registering is and what a valuable role the staff of driver license offices play in this process. My daughter is alive right now because a person getting a license at the DPS also chose to register as a donor. You may see it as just a check box on a form, but – take it from me – it’s really a chance to be someone’s lifesaving hero. 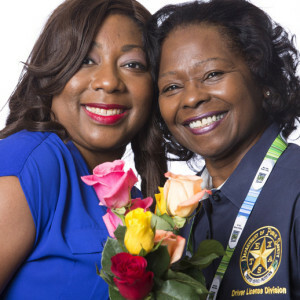 Marilyn and Monica have been chosen to represent Donate Life Texas at the 2016 Tournament of Roses Parade on New Year’s Day in Pasadena, California. The Donate Life Rose Parade float has become an annual parade tradition to celebrate donation and its unique power to save, heal and transform lives. The float is accompanied each year by donor families, living donors and transplant recipients, like Monica. It is also decorated with floral portraits, called floragraphs, of donors who have given the ultimate lifesaving gift of organ, eye and tissue donations. Learn more about the Donate Life Rose Parade Float and Donate Life Texas’ announcement for this year’s event.